Experience the best of both worlds in Los Cabos, Mexico. See the surrounding area on land and sea. Reel in a Monster while Deep Sea Fishing in Cabo! Cabo San Lucas Mexico is one of the ultimate vacation destinations. The bright sun, white sand, blue sea, and monster sized deep sea fish! 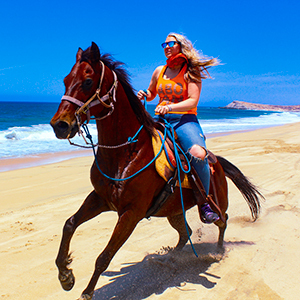 Have some fun on dry land with ATV and UTV tours, horseback riding or just relaxing on the beach. From January through March you may even be able to see gray whales migrating past Migrino Beach. Marlin is the fish most serious fishermen and women hope for, and they are common around Cabo. Meet up with an experienced captain and crew, board their vessel and head out for some deep sea fishing. Fishing gear and bait will be provided for you, but it’s all up to you to reel in the big one. Marlin up to 150 pounds, Dorado up to 30 pounds, and a wide variety of other fish including Wahoo, Skipjack, Yellow-fin Tuna and Crevalle can be found in these waters. Bring SPF 30+ Sunblock, wear comfortable tennis shoes and a hat. Spending time in Cabo is a lot of fun, being sunburnt to a crisp is not! Drivers of ATV/UTV’s must be over 16 years old; passengers must be at least 5. Weight limit on ATV’s is 517 pounds, UTV’s is 800 pounds. No more than 2 people per vehicle. Trophy fish may be able to be kept on ice. Check with your fishing guide to be sure. Also remember to check with your airline or cruise ship to see if frozen fish may be transported to your home country. Are you ready to book the adventure of a lifetime? Contact us now to reserve your spot!